Stocks are opening lower on Wall Street after several big companies including Bank of America reported financial results that fell short of what analysts were hoping for. NEW YORK (AP) — Stocks are opening lower on Wall Street after several big companies including Bank of America reported financial results that fell short of what analysts were hoping for. 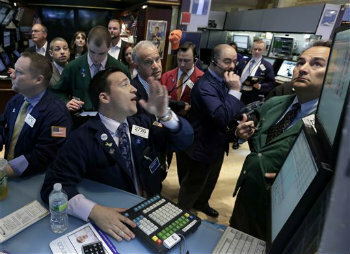 The Dow Jones industrial average fell 105 points, or 0.8 percent, to 14,652 shortly after the opening bell Wednesday. It rose 157 the day before. The Standard & Poor’s 500 index was down 16 points at 1,558, a decline of 1 percent. The Nasdaq composite fell 35 points, or 1.1 percent, to 3,229. Bank of America fell 4 percent to $11.80, the biggest percentage loss in the Dow, after reporting earnings that missed analysts’ estimates. Textron fell 11 percent to $26 after cutting its forecast for deliveries of corporate jets. Toy maker Mattel jumped 4 percent to $44.61 after its net income quadrupled.